TURBO RALLY IX IN BRYSON CITY, TENNESSEE – WHAT A BLAST! Kawasaki Turbo guru, Horsepower Unlimited proprietor, and all-around nice guy Mike Chestnut promised a strong showing of GPz Turbos at Turbo Rally IX – The Bryson City Blast. On Saturday, June 5, 1999 thirty-one factory turbos, twenty-three (75%) of them Kawasakis, one Aerocharged Harley-Davidson, one insanely modified ex-Ted Miller streeterized drag bike, and one wild, 1074cc CBX with single-sided swingarm piloted by the even wilder George Dillaway (he’s so far gone, the nuts in the CBXIOA call him Crazy George) were present in the back parking lot of the Bryson City Sleep Inn, heretofore known as Turbo Central. It just goes to show you Mike Chestnut is a man of his word. It was thrilling to motor through the twistiest roads in the good ol’ U.S. of A. with thirty or so other factory turbos. We shortened the straights and carved the curves of the Smoky Mountains without attracting any notice. It seems the original interest in turbo bikes is long past and the new performance crowd is too young to know that stock, factory-produced, wheelieing, arm-straightening, and tire-smoking motorcycles existed before some of them were even born. No matter. We knew what we were and we revelled in it. What were the highlights? Well, the entire weekend was a highlight, but a few things stand out in my mind. One was the audience Mike “The Pope” Chestnut commanded when he held his “High Performance Seminar” in the parking lot of the hotel on Saturday night. After a full day of laying waste to Deal’s Gap, The Foothills Parkway, and The Cherohala Skyway (more on this, later), thirty ralliers gathered ‘round on poolside deck chairs under the yellow glow of parking lot lights to hear a sermon GPz Turbos. They heard tales of exploding turbos tearing through fancy BMW sedans; late-night wheelie contests on the back streets of Los Angeles; and how Mike has had enough of the over-rated California Crowd (his words; I’d describe them as having their heads where the sun doesn’t shine) and yearns to build a High Performance Turbo Compound in the hills of western Tennessee just as John Burns knew every turbo owner is wont to do. The believers’ eyes and ears were focused on Mike, their faces straining to hear every word about how to build extreme performance motorcycles without making your bank account, or your wife, disappear. By no coincidence, it always began with a GPz Turbo. If you listened closely, you heard the story behind the story of how Mike’s entry into Sport Rider’s 1996 UFO Contest, the one where he embarrassed the big-name high performance shops (and their $50,000 non-licensable creations) with his 230 h.p.- 9.34 second GPz Turbo (that he built in his spare time), came about because some of those big names didn’t have their entries ready by the contest deadline. Mike was called in at the last minute to “fill the bill”; sort of a “hey, we can’t get anyone else, so let’s call Mike” deal. Never receiving the credit he deserved for building the ultimate, ridable, tourable, true street bike (for $12,000, including the motorcycle), Mike is too nice a guy to proclaim what I will – that Sport Rider should have called Mike FIRST. Another highlight for me was the number of new faces at the rally. Twenty-five rooms at the Sleep Inn were occupied by rally goers from California, Texas, and Michigan; Wisconsin, Kentucky, and Pennsylvania; North Carolina, Ohio, and Georgia; Kansas, Delaware, and Illinois. It was impossible to get a count of everyone attending, but fifty is probably not far off and half of them I didn’t recognize. There were California Surfer Dudes, Kentucky Hillbillies, and Dixie Rednecks all talking turbo and getting along just fine. Adding their bit of Northeast charm were the New Jersey Bad Boys who were quick to point out they take care of business by giving you cement shoes and dumping you in the nearest river. That seemed kind of tame when you consider, if they don’t like you in the South, they chain you to the back of a pick-up and drag you down the road until there’s no place left to put cement shoes. The final highlight, for me anyway, was the skill of the riders. It’s rare to have this large a group of strangers gather and then ride so well together. This became apparent when, after a cooling stop for ice cream and a wade in the Tellico River, Mike Chestnut led twenty turbos in an 80 m.p.h. freight train up the Cherohala Skyway. Things stayed orderly (for a while) until Mike, and a few others on 150-200 h.p. Kaw Turbos, decided they’d had enough restrained running and uncorked their Horsepower Unlimited Specials for the 5500-foot climb to the top of the mountain. Can you say, turbo free-for-all? A highlight I’m certain everyone who was there will agree on was the sight of a Yamaha R1 and Honda F4 quickly gearing down and ducking into the boat launch area at the top of Deal’s Gap as thirty or so Turbo owners looked on. It didn’t take long to see or hear the reason for their maneuver as a Blount County Sheriff’s car sped past fifteen seconds later. The best part was the reaction of the riders when the sheriff had passed. The R1 screamed from its hiding place and blasted back through Deal’s Gap at a race pace. The F4 snuck up on us and then the rider did a gigantic, crossed-up snap-wheelie as he went through the gears around the bend in front of us. Fifteen minutes later the same sheriff rode slowly by, going back through Deal’s Gap, and looking a lot like the sheriff from “Smokey and the Bandit”. I’m certain there are many special moments I missed. Of course, everyone has their own personal highlights from every Turbo Rally, but the overall success of this event and the increasing popularity of turbos was evidenced by the one question I was asked dozens of times that weekend – “Hey Bob, when’s the next one?" Yea, TR9, it was a blast. Turbo Rally IX (1999) in Bryson City North Carolina was a resounding success. People traveled from all over the Eastern seaboard and Canada to be there. 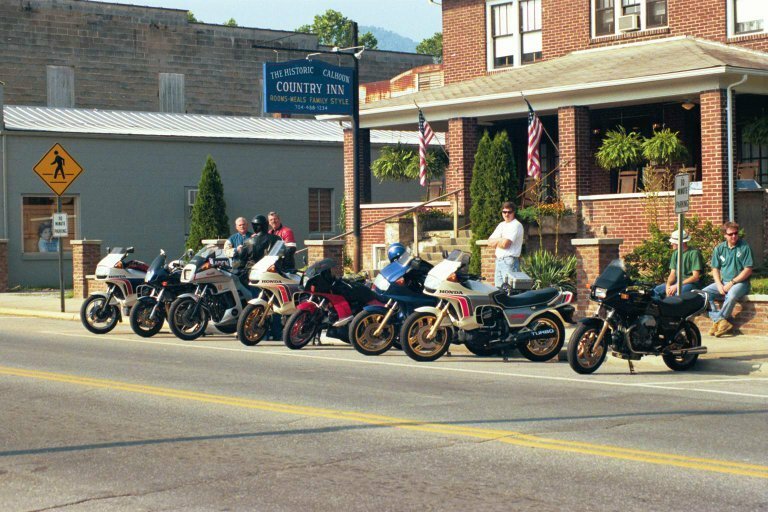 Here a small group of bikes are parked while the group was inside enjoying breakfast before the start of a full day of riding.